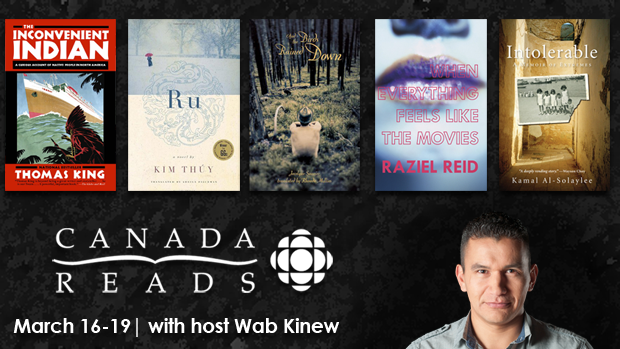 Canada Reads panelists and their book choices were announced this morning on CBC Radio. These titles may all be wonderful but there was one missing I had hoped would be a contender. 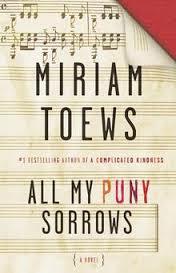 All My Puny Sorrows, the 6th novel from Miriam Toews, one of 15 longlisted books for Canada Reads, didn’t make the cut but it wins my Red Chronicles Best Read of 2014. The story: two sisters, bonded in love even as one wants to end her life with the help of the other. Inspired by her own relationship with her sister Marjorie, who took her life years after her father committed suicide, Toews distills sadness and then infuses it with all the shades that make it bearable. Not once did the book weigh me down with the dark subject. Beloved already for all her earlier work, this Canadian author treads deliberately with humour and the result is nothing short of brilliant. She told me that the most important thing was to establish the tenderness right off the bat, or at least to the top of the piece, just a hint of it, a whisper, but a deep whisper because the tension will mount, the excitement and the drama will build-I was writing it down as fast as I could-and when the action rises the audience might remember the earlier moment of tenderness, and remembering will make them long to return to infancy, to safety, to pure love, then you might move away from that, put the violence and agony of life into every note, building, building still, until there is an important decision to make; return to tenderness, even briefly, glancingly, or continue on with the truth, the violence, the pain , the tragedy, to the very end. It may be odd to describe a book about suicide as alive with joy but that is exactly what Toews accomplishes here. I felt pushed to new understanding of this idea of planning one’s own death but far more-I wept with the glorious mess of it all. If you have a sister, as I have three, then you too will laugh then cry then laugh again. A great read should do just that. It should trek back to childhood and root around for a while in hilarity, even as it soars forward with giant sad leaps. A great read will bring out all your yellow stickie notes to mark page after page that leave you breathless and ignoring the doorbell, the phone ringing, the dinner burning, the kids calling. All My Puny Sorrows will make you better at living.